I was first exposed to tapas in college when I worked at The Shakespeare Theatre in Washington, DC. A few doors down from the theatre, on the corner of 7th & D, NW, was a Spanish restaurant, Jaleo. 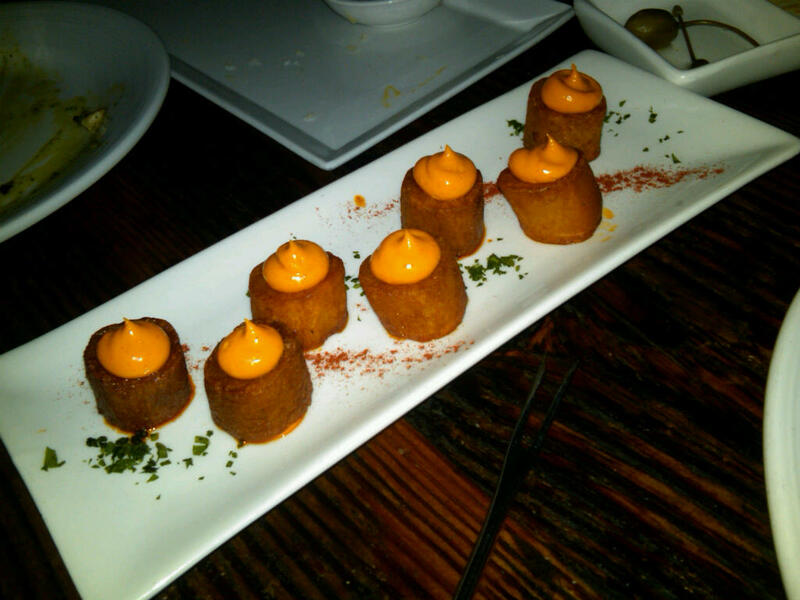 We often recommended Jaleo to our patrons for a light, pre-theater meal or a late night, post-show snack. Jaleo is owned by renowned chef and restauranteur, Jose Andres who single handedly brought the tapas revolution to the United States (in my humble opinion, that is.) I enjoyed many a post-shift glass of sangria with a side order of garlic shrimp and laughter at Jaleo during my time in DC. In fact, my family and I dined at Jaleo and Zaytinya, Andres’ Mediterranean mezze restaurant during my tour de food graduation weekend in 2003. That said, when Amada opened in Philadelphia in 2005, I was cautiously optimistic that a tapas restaurant was finally coming to Philadelphia. Since then, I’ve been to Amada 3 or 4 times. While I enjoy my early visit(s) it was not until my two most recent visits that I had the complete experience. I will be sharing the story of my most recent visit for a friend’s birthday, although my previous visit bears mentioning because my husband and I did a Garces Restaurant Group restaurant crawl for our first wedding anniversary this past June. I received tickets to The Real Americans, an amazing one-man show that played during First Person Arts‘ annual festival. Luckily, it was my co-worker’s birthday and it seemed like a great opportunity for a birthday outing. We arranged to meet at the Painted Bride for the show and grab a late bite to eat afterwards. We figured Amada was the best option because they were open late and we could probably just eat at the bar. When the show got out at 9:45, we walked over to Amada with Michael and his friend Heather. The walk from The Painted Bride to Amada isn’t very fun in heels in case you were wondering. When we got into Amada at around 10pm, the place was packed! There was barely even any standing room at the bar and the host told us it would be a 30 minute wait for a table. We conferred and decided that we were too hungry to wait that long. After stepping outside, we conferred again and realized that we probably wouldn’t be able to get into any place as good as Amada and we would just finagle a standing room spot in the bar area. When we walked back in, the host said that a table had actually opened up at the bar and they could seat us immediately. Well what do you know?? Kismet. We hopped up onto our contoured bar stools and perused the menu. Michael gave me full reign of the menu (I knew I liked that guy!) and my husband is confident that I know his taste and food preferences. Heather had a few key recommendations and we ended up with the following order. At Amada and many tapas restaurants, the dishes are brought to the table as they are made. The waitstaff did a nice job of pacing our food without overloading us. However, once the first pitcher of sangria came, it was on…our food flooowed like our sangria did! 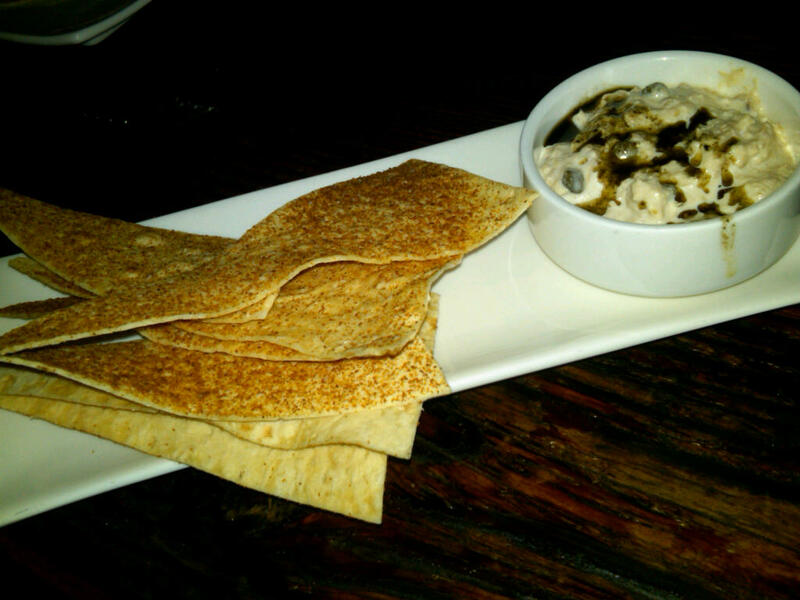 We started with a complimentary dish of cheesy crisps with a tuna dipping sauce. This sauce can be off putting if you are not expecting tuna, but it is pleasantly smooth and unfishy, balancing nicely with the crunch of the cracker. Before we finished gorging ourselves on that dish (remember, it was after 10pm and we were hungry!) our food started to arrive. 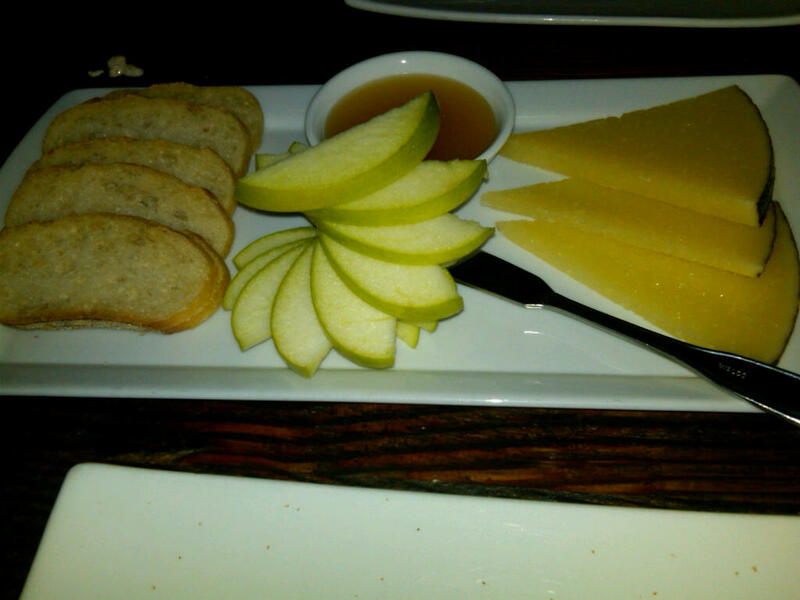 We began with the manchego cheese, served with bread, sliced apples and the aforementioned truffle lavender honey. This is their most popular cheese order for a reason. The cheese was a traditional manchego but the honey was such a unique flavor mixture–the truffle providing an earthy umami flavor while the lavender balanced that with a floral sweetness. They sell the honey in jars and I was certainly tempted. Next came the Serrano ham. 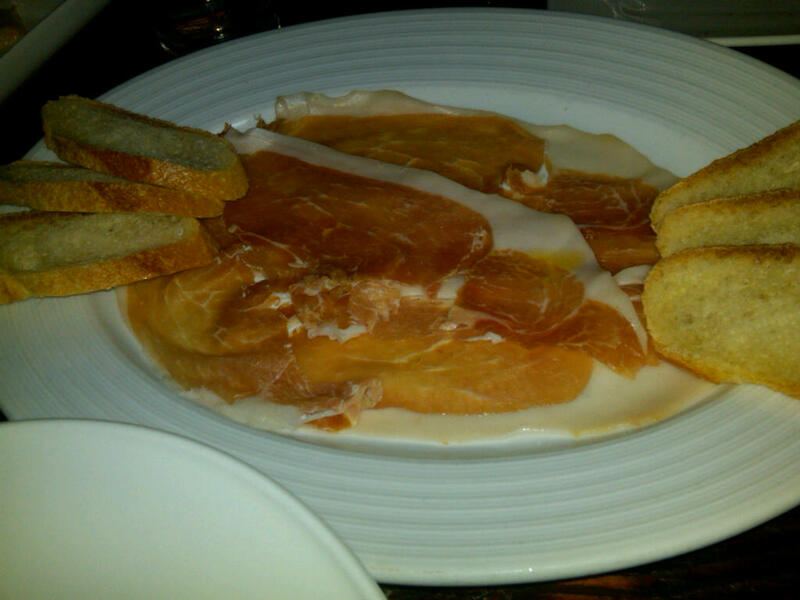 I’m not a ham eater but Heather’s report (this was a nostaglic order for her, having eaten Serrano ham in Spain) was that it wasn’t quite as good as she has had in the past, but it was certainly enjoyed by all–it was all gone by the end of the evening. After the ham came the grilled calimari a la plancha (plank) and the pumpkin soup. 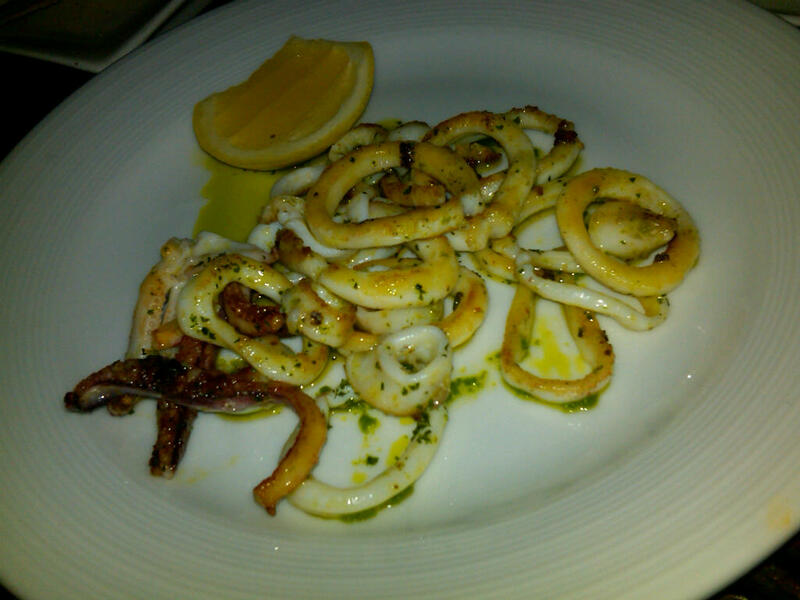 The calamari wasn’t very visually appealing but it was certainly tasty. Although I’m the first person to order a fried calamari dish, there’s something refreshing about char-grilled calamari, especially when the chef has gotten a lot of the chewiness out of it, as in this dish. It was a subtle flavor boosted by the squirt of lemon and flavored olive oil on the plate. I once read about a chef who ran his calamari through a clothes dryer in order to tenderize it to his liking. The pumpkin soup emanated fall. 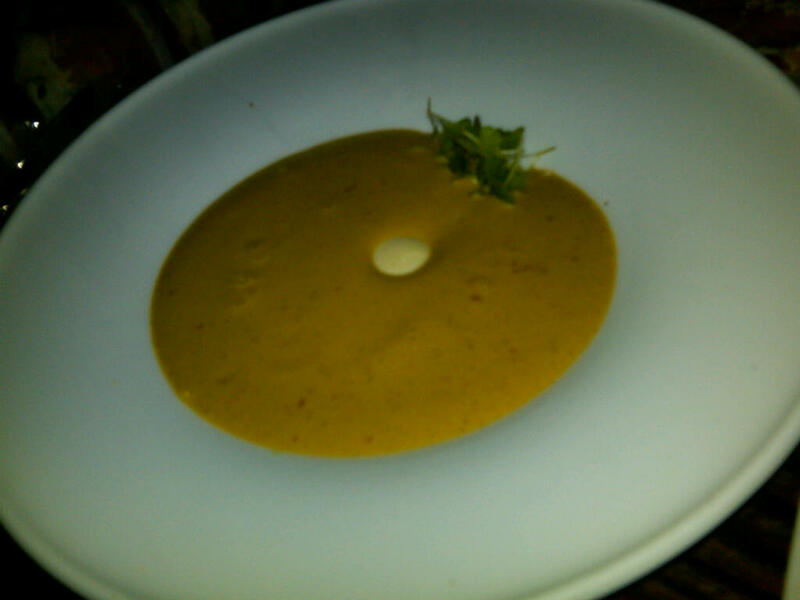 It drives me crazy that I can’t remember what type of creamy flan was in the center of the bowl–the soup was poured table side. If only Amada would update their website with a more seasonal menu…The pumpkin was incredibly rich and creamy without being heavy and overpowering. The perfect bite involved just a bit of flan in a spoonful of soup. Thus concluded our first mini wave of food. Our second wave was kicked off with this thing. I admit, when they brought it to the table I thought they had the wrong dish for sure. 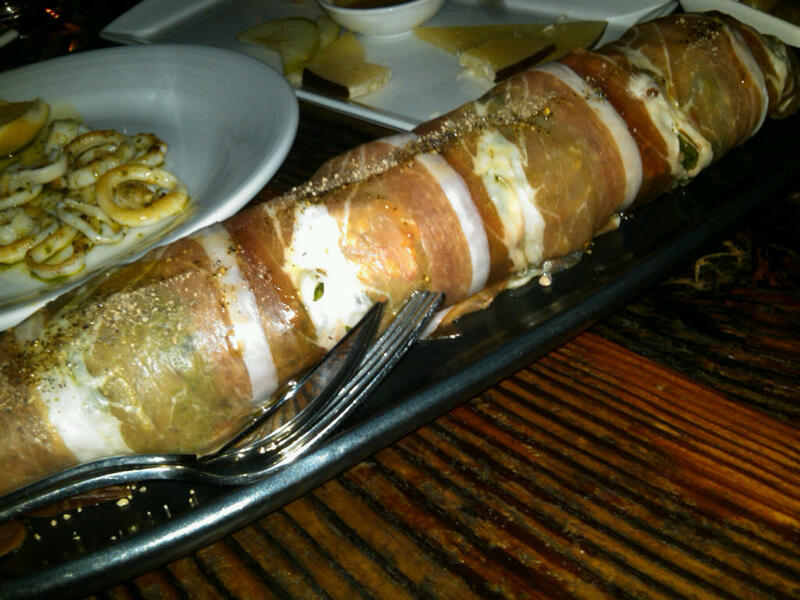 It looked like some sort of ham wrapped pork loin. 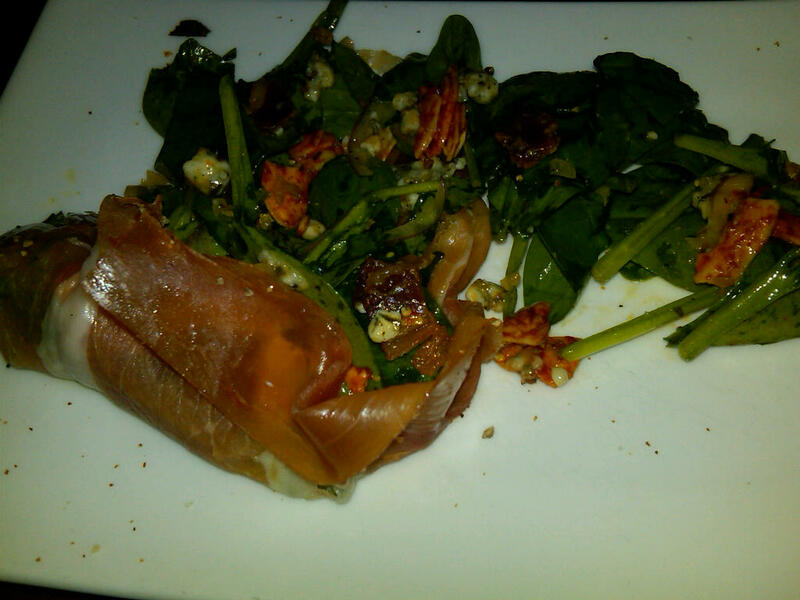 Instead, we soon discovered that this was the Serrano ham, fig, cabrales and spicy almond salad. 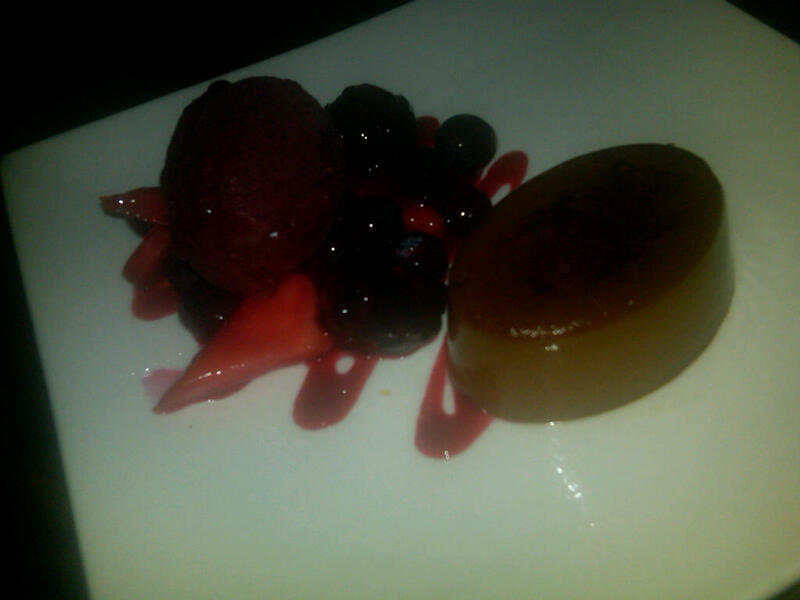 While poor picture quality, this should give you a general idea of what it looked like on the plate. The simple salad was a clear front-runner for best dish of the night. Who ever would have known? Next up were the patatas bravas (friend potatoes.) I have fond memories of ordering these at Jaleo–they came in a little clay tapas pot and were great, rustic finger food. At Amada they’re a little more refined, yet I love the smoky paprika crema perched daintily on each potato. 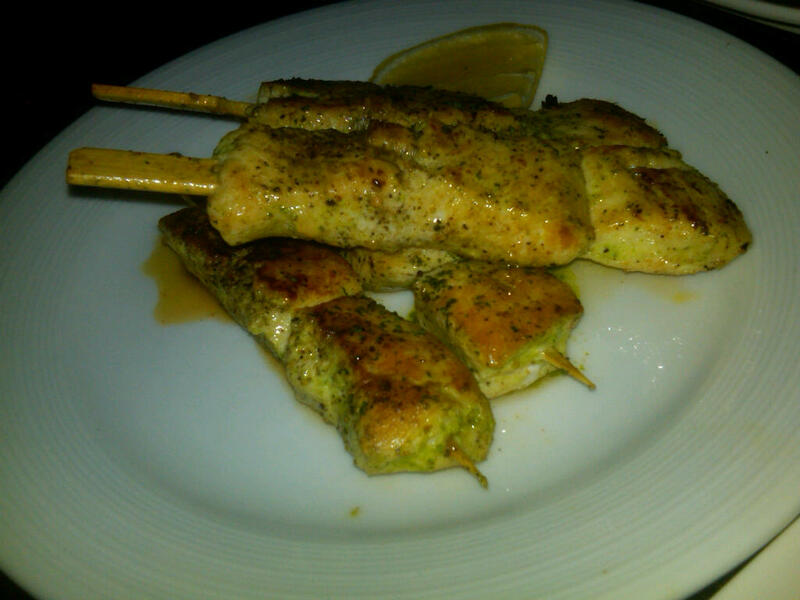 Next up was the grilled, skewered chicken. It was fine. The chicken was moist and juicy, but the flavor was nothing to write home about. I know, I know, it’s chicken. However, we decided as a table to get the chicken because we were getting such a grand variety of other meats that we thought it would round things out a bit. After the chicken, things improved vastly. We were so excited to eat this flatbread that I forgot to take a picture of it before we started dividing it up. I’ve eaten iterations of flatbread at a number of different Garces restaurants (random fact, I know) and have thoroughly enjoyed them in each place. This tells me I should be ordering flatbread more often. 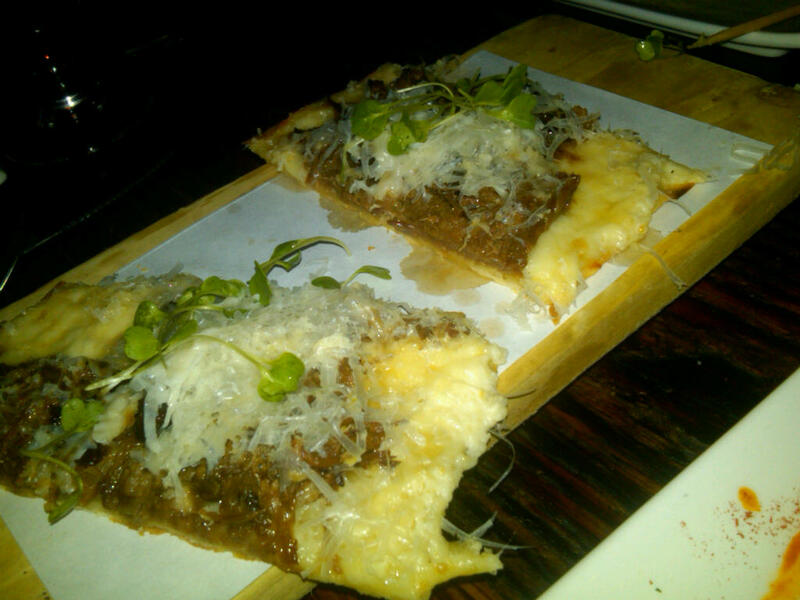 This had the meaty richness of the shortribs with the tang of the parmesan and crunch of the flatbread. Funny fact–when I was typing this, I mixed up “shortrib” and “flatbread” and kept writing “shortbread.” It would have been very strange had I eaten a shortbread entree. Good thing I occasionally glance over these posts before hitting publish. Ohhh, I almost forgot. The clams and chorizo were next. This was my favorite dish. 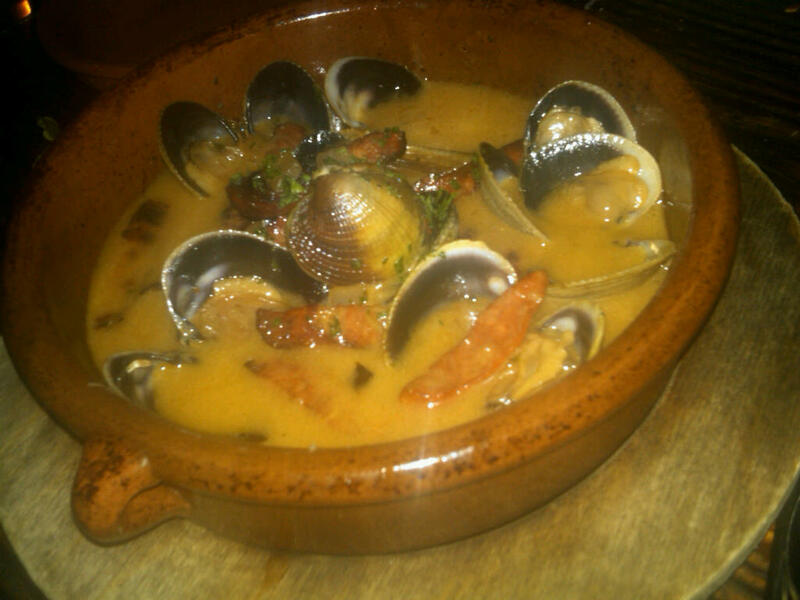 Yeah the clams are kind of little but I could pick up that broth and drink it and its spicy, earthy, tomatoey goodness. Actually, I pretty much just ate the broth as a soup, using empty clam shells at first and then threw caution to the wind and straight up used my soup spoon. I have no shame when it comes to good food. The asparagus was next. Wow, my pictures got progressively worse throughout the night. You do the math. 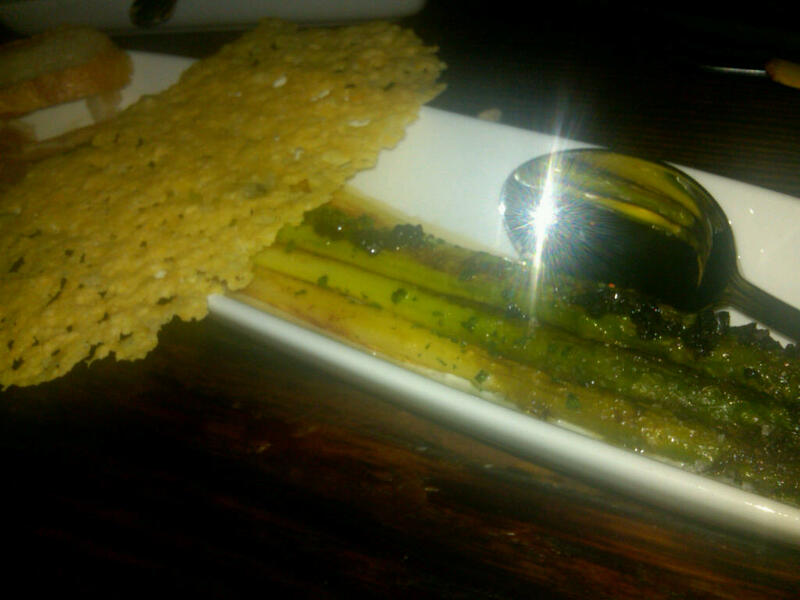 The asparagus was tasty, albeit a bit tough to cut, with the gooey poached egg and truffle. I just loved the mahon crisp, personally. And that, my friend, was our dinner at Amada. Oh wait, I forgot to mention dessert! I’m not usually a big dessert fan–I get my kicks on the savory side of things. However, because it was Michael’s birthday, I wanted to embarrass him with candles, loud singing and a birthday crown. Then I remembered that we were at Amada and not Chuck E. Cheese. Instead, I opted to subtly ask the waitress if she would stick a candle in whatever dessert we ended up ordering. I also instructed her to bring out a certain dessert just in case Michael and Heather weren’t in the mood. I’m so sneaky! We ended up deciding on one dish for the table–crema catalan de chocolate–which was basically a chocolate custard with a scoop of raspberry sorbet. 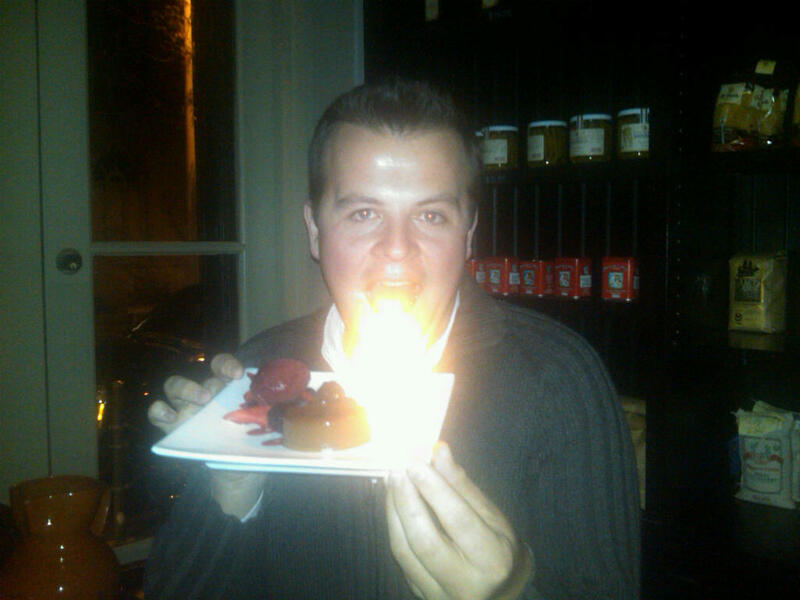 Michael was shocked when the waitress came bearing the candle. “How did she know?” he kept asking. Hehehe. We snapped a photo before he blew out his candle and I think it looks pretty artistic. This dish exceeded my expectations. I tried a little bite and couldn’t get enough. A little scoop of custard with a hunk of raspberry sorbet was the perfect chocolatey/fruit combination in my mouth. Happy birthday, Michael. Thanks for sharing your special day with the Row Home Eats readers!